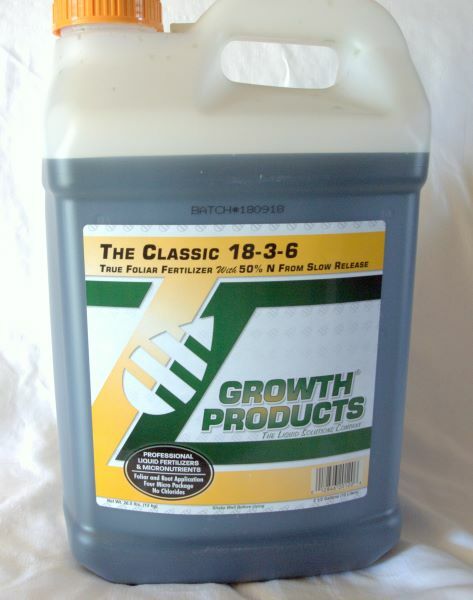 Growth Products 18-3-6 Classic Fertilizer with 50% Slow Release Nitrogen is one of the industries best liquid fertilizers and made with the highest standards and finest ingredients. For home lawns, it is one of the absolute best. It is routinely used in the sports industry on gulf courses, including greens, tees, fairways and professional sports fields and is used by the better professional turf companies. We are now offering it to our customers as well. If you are looking for the finest liquid fertilizers, then this is it. The Classic 18-3-6 with 50% slow release Nitrogen plus micronutrients is a concentrate that can be used on any type of turf as well as soil injected around trees and shrubs. It can be sprayed with a hand sprayer or backpack sprayer up to large multi-gallon sprayers and high pressure sprayers. For home lawns, 18-3-6 classic is safe to use on newly seeded lawns and established lawns of Bentgrass, Ryegrass, Fescues, Bluegrass, and warm season grasses, including Bermudagrass, Zoysia, St. Augustine, and others. It can also be mixed with Herbicides, Fungicides, and Insecticides. Basic Mixing Rates are listed on the bottle, but here is a quick fertility reference for homeowners. *** All references are ounces of product per gallon of water per 1000 sq ft.
** High maintenance sports turf may require more applications at different rates.